With red and green lenses. 1 mile visibility for sail or powerboats under 39'. Pre-drilled with countersunk holes to accommodate #8 screws. Housing is die cast zamak. 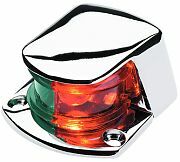 Size: 2-3/4"L x 1-3/8"H x 2-1/2" base width.